NIST was one of the first radio broadcasters, initially transmitting music and speech and then pioneering a market and crop report service. The purpose was research, not entertainment; the Institute sought to overcome the technical limitations of this emerging medium. A major problem with early radio was poor reception, caused by interference among stations that veered off assigned frequencies. To help stations control their transmissions, the Institute established a standard of frequency and began broadcasting precise frequency signals over its laboratory transmitter, WWV, in 1923. As shown in the photo on the right, NIST radio station WWV had two transmitting antenna towers in 1923, a short one (on the left) for short waves and another one for standard transmissions. It was the start of a service that continues to this day; time signals were added in 1945. NIST also performed important research that greatly improved understanding of why radio reception sometimes fades out suddenly. After collecting copious amounts of data, researchers confirmed the underlying problem as solar activity, later correlated with numbers of sunspots. The group's method of predicting sunspot numbers proved useful for decades. Today, WWV and WWVB (in Colorado) and sister station WWVH (in Hawaii) serve radio and television stations, power and telephone companies, the financial community, scientists and engineers in many fields, computer networks, and navigators. These NIST frequency services enable laboratories to calibrate precision oscillators to an accuracy much better than one-thousandth of a second in three years. Relying on foreign technology is risky. The United States learned this lesson early in the century when it imported all its high-quality optical glass and instruments, and World War I suddenly cut off the supplies. The situation was so dire by 1917, when America entered the war, that citizens were asked to lend their binoculars and field glasses to the military. So NIST began studying the manufacture of optical glass, a mixture of silica and chemicals melted in a clay pot, which often deteriorated and contaminated the glass. After more than a year's work, the researchers produced a superior clay pot, greatly reducing the difficulty, time, and cost of making these containers. The Institute made nearly 7 metric tons (15,000 pounds) of eight types of glass during the war, continuing its crucial research and production through World War II and into the 1950s. The most ambitious undertaking in the history of the Institute's glass plant was the casting of a 1.8 meter (69.5 inch) disk—then the largest in the nation—for the mirror of a large reflecting telescope. No other U.S. plant was equipped to do it. Four disks were poured that cracked during cooling. The fifth one, poured in 1927 and pronounced a success the following year, was cooled very slowly, by as little as 1 degree per day. 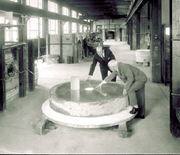 The 1.7 metric ton (3,800 pound) disk was subsequently presented to Perkins Observatory at Ohio Wesleyan University. This success influenced the Corning Glass Works in casting a 5 meter (200 inch) mirror for what became the largest optical telescope in the world, at Palomar Observatory in California.